Create custom mug by adding a photo, logo or inspirational quote. Personalised coffee mugs make great unique gifts and are also good for promotional events We have a large selection of mugs that we overprint with your design, company logo or greetings. 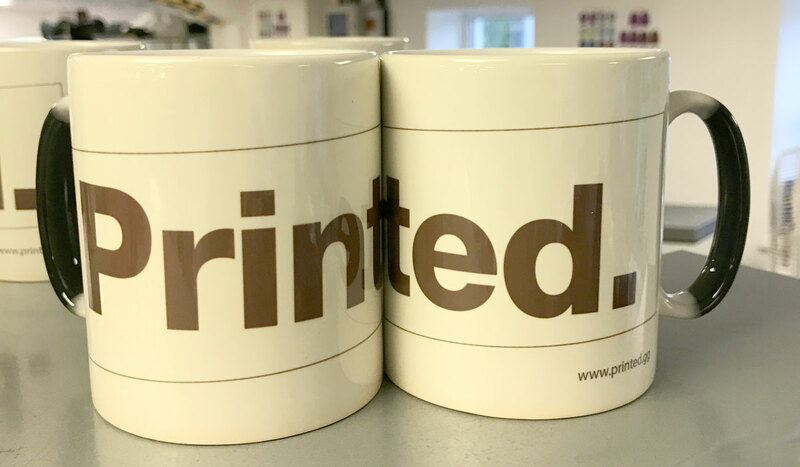 You’d be surprised just how many mugs we print on a daily basis. Finalise that professional look in your office with matching coffee mugs! Our ceramic mugs are manufactured with a superior quality heavy weight ceramic dishwasher safe premium coating. Bright white in colour and with a high gloss finish, the coated ceramic mug is ideal for personalising with your wording, image or logo. 10oz capacity.Dishwasher resistant up to 800 wash cycles at 45°C. We also have a range of two tone coloured mugs, flourescent mugs, outdoor adventurer mugs, heat change mugs, tall latte mugs and bone china mugs – call for details.